In the past, trams were the main form of public transport in Sydney, just like they are in Melbourne. It was after the 1960's era that buses replaced the trams, and now many Sydney siders want the trams to return. Speaking of which, the Government is planning on bringing back the trams on George and Oxford Streets in particular. Sydney does have a light rail system, starting at Central Station, and has been expanded from The Fish Markets to Lilyfield. Sydney residents were able to vote at Customs House in early 2013. 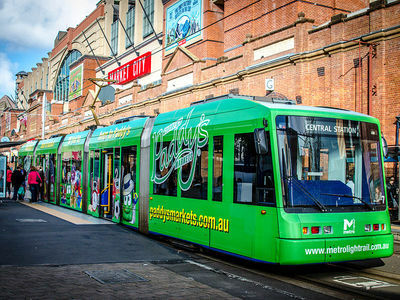 Should Sydney bring the trams back? Yes. The general consensus is that the majority of Sydney want the trams back. Too many buses. Yes! Trams are much more convenient especially if you wanted to get off a few streets down the road (but it's too far to walk when you've got bags of things or you're tired). Buses makes it so much more difficult. I quite like the system that Melbourne has. Definitely - fast and efficient transport system to take people around the CBD - adds also to the ambience of the city - Melbourne and San Francisco have similar transport that has worked for many many decades. If it's anything like the tram system in Melbourne then definitely yes! The public transport system in Sydney is going downhill, and fast! I would be very happy to start using trams in sydney.